An inquiry is to be held into the impact of devastating flooding on Cumbria's transport infrastructure. During last month's storms six bridges collapsed, one leading to the death of a police officer, and others were damaged. 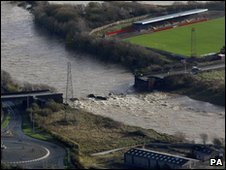 A railway station and footbridge had to be built to reconnect Workington after collapsed bridges left it split in two. The Commons Transport Committee will look into the causes and whether roads and railways were adequately protected. Members of the committee will investigate whether structural flaws, the age of the bridges or maintenance of them led to their collapse. They will also examine the likelihood of similar incidents being repeated in other parts of the country in the event of floods. Prime Minister Gordon Brown has pledged that the government will fund any road and bridge repairs in the county. On Monday, a temporary Army-built footbridge opened in Workington, to help reunite the community split by the River Derwent. It is named Barker Crossing, after Pc Bill Barker who was swept away when the town's Northside Bridge collapsed, and is 300m (980ft) upstream of the unusable Calva Bridge, which is currently being assessed for repair or demolition.